Kraft paper bags have become more and more popular because they are made from kraft paper-- brown kraft paper, white kraft paper,natural craft paper,ribbed kraft paper--- that is 100% recyclable,100% bio-degradable. As eco friendly shopping bags, kraft paper bags are cheapest shopping bags and promotional bags, that is another characteristic favored by many business owners. Kraft paper bags are the most cost effective way to convey goods,with printed design art, kraft paper bags are great as promoting business brand and products in green way. As paper bags manufacturer,Shopping Bags Mart specialize in manufacturing kraft paper bags including brown kraft bags,white kraft bags coming in any size,color,shape,finish to fit any end. Shopping Bags Mart specialize in manufacturing full range of twisted handle kraft bags including twisted handle white kraft paper bags,twisted handle brown kraft paper bags,twisted handle recycled kraft paper bags. made of brown kraft paper,white kraft paper,ribbed kraft paper,grammage range from 80g,100g,120g to 150g to suit different size and product. twisted handle are available in any color,easy to match logo or background color. any printing color is available,whether it is just text,or pantone color solid background,or full color photographic image. Shopping Bags Mart specialize in manufacturing flat handle kraft paper bags including flat handle white kraft paper bags,flat handle brown kraft paper bags,flat handle recycled kraft paper bags. made of brown kraft paper,white kraft paper,ribbed kraft paper,paper weight range from 80g,100g,120g to 150g to suit different size and product. Flat handle are available in any color,easy to match logo or background color. Shopping Bags Mart specialize in manufacturing and wholesale euro style luxury kraft paper bags including luxury white kraft paper bags,luxury brown kraft paper bags,luxury recycled kraft paper bags. Any printing color is available,whether it is just a text,or pantone color logo on solid background color,or full color photographic image. Finish including hot stamping,embossing,uv spot varnish can be used to highlight business brand and logo. Shopping Bags Mart specialize in manufacturing full rangeof kraft paper bags including brown kraft bags,white kraft bags,twisted handle kraft bags,flat handle kraft bags,luxury kraft bags coming in any size and color. 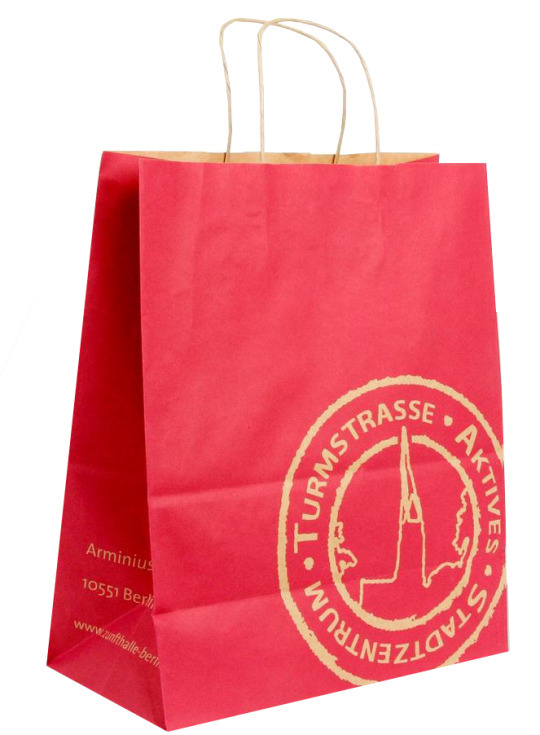 Twisted Handle Kraft Paper Bags With Printed Logo From Shopping Bags Mart. This is natural kraft bag, it is made of 100g natural kraft paper with twisted paper handle,one pantone color printing,100% ink coverage with reversed logo. Kraft paper bags are 100% recyclable,great as eco friendly shopping bags or promotional bags.With custom printing, kraft paper bags are not only as eco freidnly carrier bags, but also as greem nessage board to advertise business.And becasue kraft paper is sturdy enough,even 80g kraft paper is good to build shopper.Because most of kraft paper bags are made of 100g kraft paper and glued with twisted paper handle or flat paper handle,the cost to create kraft paper bags is lower than other bags.It is the advantage of kraft paper bags that are favored by so many business. Shopping Bags Mart specialize in manufacturing quality kraft paper bags,kraft shopping bags including brown kraft bags,white kraft bags,twisted handle kraft bags,flat handle kraft bags and more coming in any size and shape,guaranteed cheap price,short run is available. Flaty Handle White Kraft Paper Bags With Full Color Printing From Shopping Bags Mart, this bag is made of 100g white kraft paper to build eco friendly construction as well as great printing effect,cmyk full color printing for custom design,colored flat handle to match bag’s color.